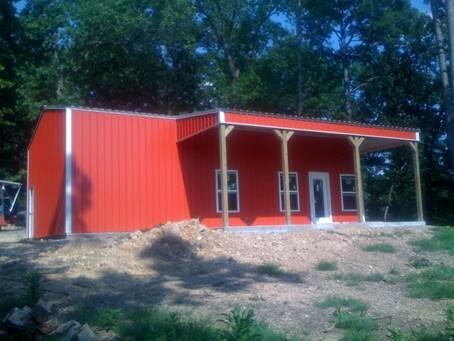 A Stick Frame Metal Building can be built on a economical floating slab with a thickened edge. 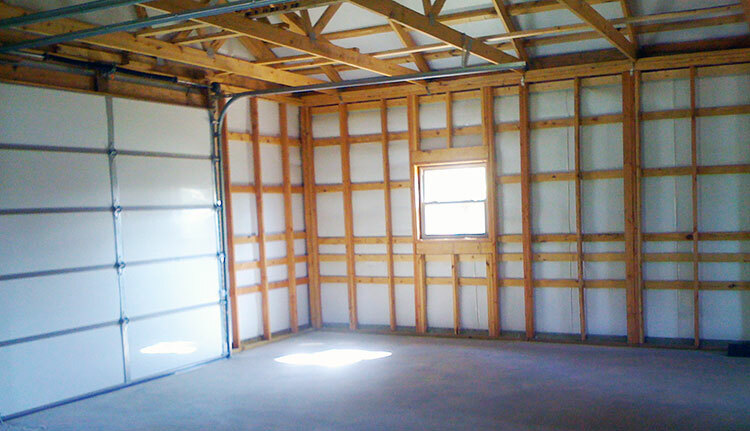 They can also be built on a foundation or on a concrete block wall foundation. 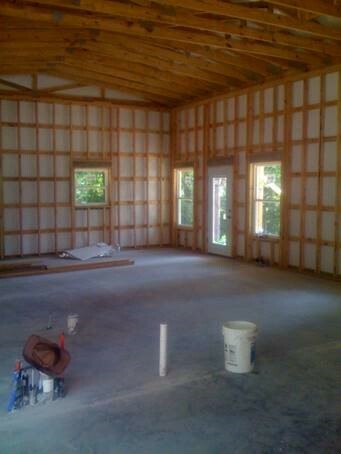 Typically Solar Guard insulation is used for both Roof and Walls to insulate these Stick Frame Buildings. The Solar Guard has a conventional R-10 value plus it has the Low-E reflective insulation. Everybody in the past has been real happy with this insulation package. If the customer is going to build in living quarters or a office, most want to add in another layer of fiberglass batts insulation. Easily accessible and coming in 16" wide rolls with dual tabs, most customers install this themselves with a staple gun. 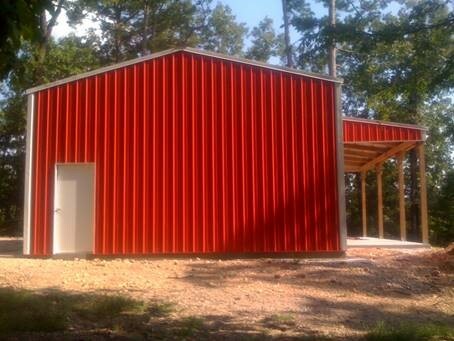 Stick Frame Metal Buildings are economical in 20' to 50' widths. 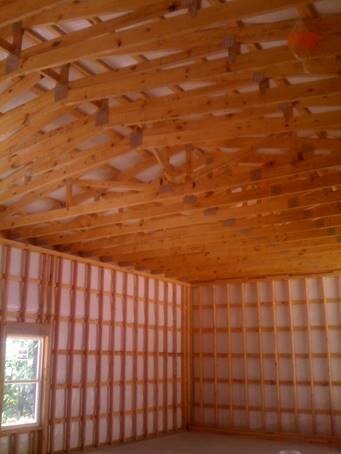 Some customers want this style of building because there is no wood going into the ground. Generally speaking this style is a little more expensive than a Post Frame Building, however they are still very reasonable and you get a lot of bang for your buck. Having decades of experience still doesn't help when dealing with a flat piece of 29 ga trim that is 20' long. It is next to impossible to get rid of all the deflection. Even by spending the time working it, till it is perfect today, it will deflect over time. Our solution is simple. By using the thicker and stiffer 26 ga for the Eave trim, it does not deflect near as much. The fasteners do not dimple the trim, plus you can make the connection tighter. The cost difference between the two types is negligible, however the appearance difference is night and day. Our trim simply looks better longer. 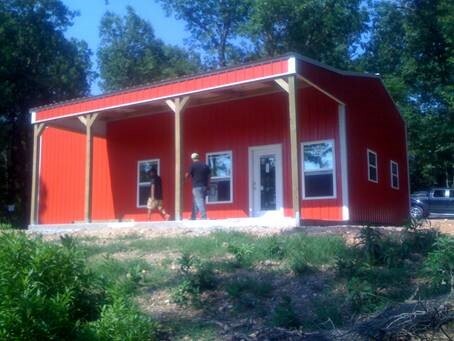 This is when $35.00 dollars makes a huge difference on a $20,000.00 dollar building. These are the small details that add up to a great building.